A Boom Boom Geoffrion Hockey Hall of Fame postcard printed in 1983. 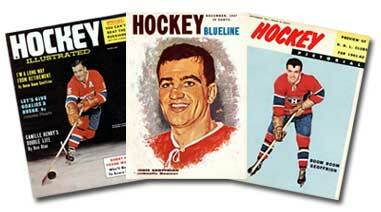 Throughout his career, Geoffrion graced the cover of numerous magazines such as this 1964 Hockey Illustrated, 1957 Hockey Blueline, and 1961 Hockey Pictorial. Three Bernie Geoffrion hockey cards, one from each of his three NHL franchise stints: a 1952-53 Parkhurst card (Montreal Canadiens), a 1966-67 Topps card (New York Rangers), and a 1974-75 O-Pee-Chee NHL coach card (Atlanta Flames). 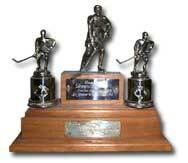 The trophy presented to Boom Boom Geoffrion by Molson Breweries Limited in recognition of his 50th goal during the 1960-61 NHL season. 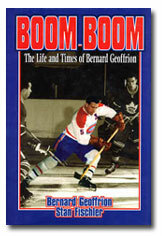 "Boom Boom The Life and Times of Bernard Geoffrion" written by Geoffrion and Stan Fischler in 1997 and published by McGraw-Hill Ryerson Limited. 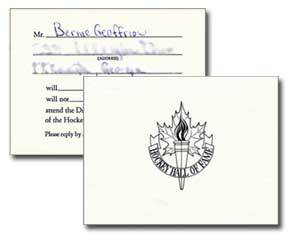 Bernie Geoffrion's hand-written reply to his 1977 Hockey Hall of Fame Dinner and Induction Ceremony invitation.